In a close series with few close games, we finally got the contest we were waiting for. The game, the Series, the entire season was in question right up until the very last at bat, when a possessed Madison Bumgarner, on two days rest, induced Salvador Perez to pop out with the tying run ninety feet away. The out marked the end of a Cinderella run by the Kansas City Royals, who sneaked into the postseason for the first time in nearly three decades and rode all the way to the bottom of the 9th of Game 7 of the Fall Classic before their carriage reverted to squash form. That out also marked the coronation of a new dynasty, awarding the Commissioner's Trophy to the San Francisco Giants for the third time in five years, a feat not accomplished since the New York Yankees in 1999 (and, before that, the Oakland A's in 1974). There's little to say about the final result, but the numbers represented above tell a story, one of a postseason that was less predictable than usual. 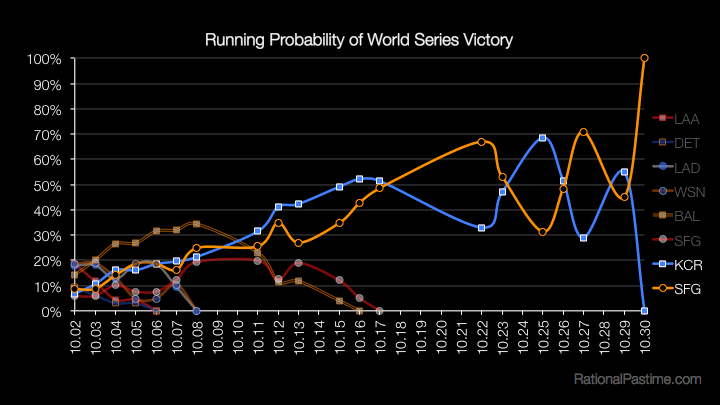 The eventual winner didn't lead the pack until the end of Game 1 of the World Series, didn't take its final lead in the World Series probability rankings until it won it all. Over seven games, the projected favorite changed sides five times. 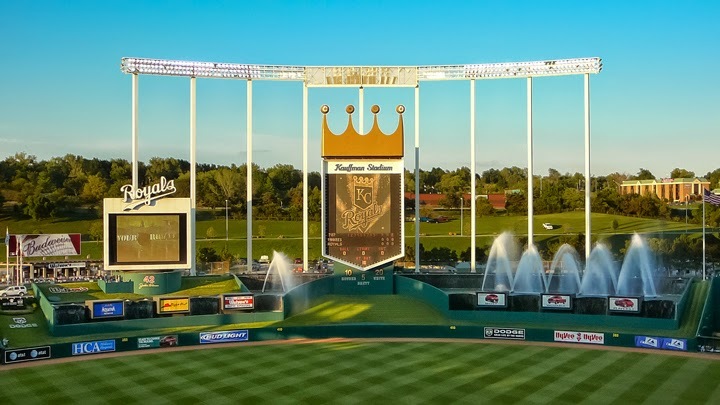 The two World Series opponents experienced rather similar trajectories up until the very end, with the San Francisco Giants averaging a 37% chance of winning it all since October 2, and the Kansas City Royals averaging 2-1 odds throughout. The Royals enjoyed a six game stretch as favorite, but so did the Baltimore Orioles earlier in the season. In addition to Baltimore, Kansas City and San Francisco, the Los Angeles Angels and Washington Nationals both enjoyed brief moments as the World Series favorite. Unsurprisingly, Game 7 of the World Series was the most consequential of the postseason, representing a 55% swing for both opponents' fortunes. This was followed by Game 6, which registered a 26% shift, Game 5 (23%), Game 3 (22%), Game 4 (17%), Game 1 (18%) and Game 2 (14%). The most consequential games of the ALCS were the first and second, which represented a 12% decline in the chances of Baltimore and a 10% bump for the Royals' fortunes. Game 1 proved the most important in the NCLS, with the Cardinals' chances declining by 7% and the Giants' increasing by 9%. The most consequential game of the LDS round was the Giants' defeat of the Washington Nationals in Game 4, whereby the Nationals' fortunes dropped from 10% to 0%, and the Giants' boosted theirs by 9%. 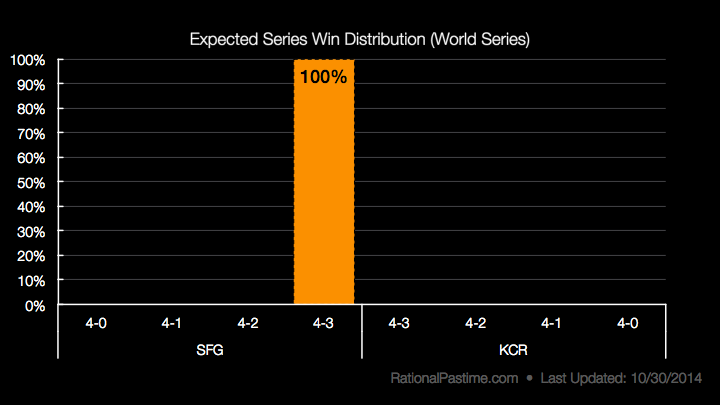 Until the World Series, it was not a particularly volatile postseason in terms of World Series Victory Expectancy. An unpredictable postseason means trouble for statistical modeling. Out of 128 possible individual World Series outcomes at the start of the LDS, a Giants win over the Royals in seven games was the 101st most likely at 0.41%. Compare this to last year's projections, which nailed the final outcome (Boston over St. Louis in six games). Furthermore, at the start of the World Series, the Rational Pastime model considered a Giants win in seven the fourth most likely outcome among eight, at 14%. When all was said and done, the model correctly picked only two of seven series: Baltimore's ALDS win over Detroit and San Francisco's NLCS win over St. Louis. Not a great showing for the model this year compared to last: in 2013 the Rational Pastime postseason projections model correctly picked the winner in five of seven series, and correctly picked the final result in four. It all goes to show what an unpredictable postseason this year's was. RP's system performed as well (poorly?) or better than just about every other prediction system or market. For those of you who followed along this October, I thank you for your readership. Check back later this week or early next week for an interactive, play-level chart of World Series Expectancy, combining FanGraphs' data with mine, similar to what I produced last November.